Summary: Ida B. has the most perfect life that she could even imagine. She is homeschooled and gets to spend her days learning from her mama, her daddy and the nature surrounding her home including the apple orchard, brook and the old tree on the hill. Everything is exactly as she'd want it to be, but then tragedy hits her family and everything changes. What I Think: I wish I knew Ida B. She is such a neat young lady! She is obviously a gifted young lady and I love how Katherine Hannigan translated a gifted/talented child's thoughts into this story. 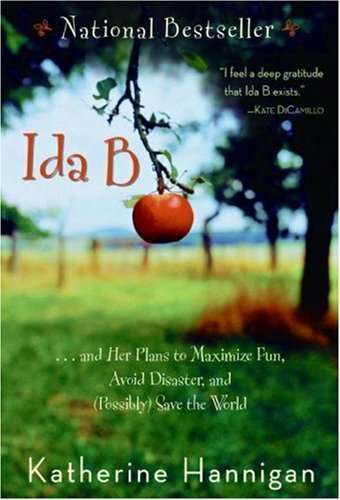 I listened to the audiobook of Ida B. (which was very well done, by the way) and as I was listening I wish I was reading, because there were snatches of mentor texts everywhere! Within the first couple of chapters, I was mesmerized with Katherine Hannigan's way with words! As a teacher, I also am so glad that Ida B. met Ms. Washington- when you read the book you will see why. It is another book where you can see the importance of being a thoughtful, caring teacher and treating our students as individuals and people. Writing Prompts: Ida B. talks about her favorite sounds and sights by using descriptive language; what is your favorite sound? Sight? Smell? Feeling? Use imagery and descriptive language while describing your favorites.